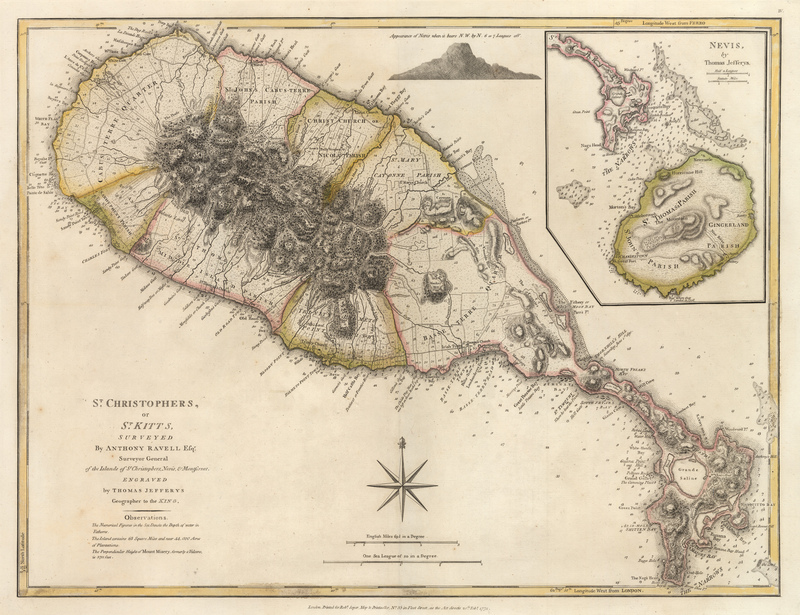 Home > New Maps > 1775 St. Christopher’s, or St. Kitts, Surveyed by Anthony Ravell Esqr. Surveyor General of the Islands of St.Christophers, Venis, & Montserrat. This fine color example of Thomas Jefferys' map of the island of St. Christophers or St. Kitts, comes from The West-India Atlas, which was first published by Sayer & Bennett in 1775 in London. The map was surveyed and drawn by Anthony Ravell and engraved by Thomas Jefferys before 1771. Jefferys’ map is one of the earliest separately issued maps of the island and the earliest obtainable large format map to focus on the region. Located in the Leeward Islands chain of the Lesser Antilles, St. Kitts and Nevis comprise the smallest sovereign state in the Western Hemisphere in both area and population. The country is a Commonwealth realm, with Elizabeth II as queen and head of state. The capital city is Basseterre on the larger island of Saint Kitts. The map features topographic detail of the island, and includes all cities, towns, ports, roads and even ponds. Topographic features of import are named, including caves, coves, bays and hills, and a number of descriptions of historical import are noted. Condition: This map is in in A- condition with even toning and some minor offsetting.